UPDATED: Norway’s state director of police asked Justice Minister Anders Anundsen on Friday for the right to carry weapons at all times, not just in special situations. Norway’s police have historically remained unarmed, but that’s changing after an increased terror threat with police as designated targets. 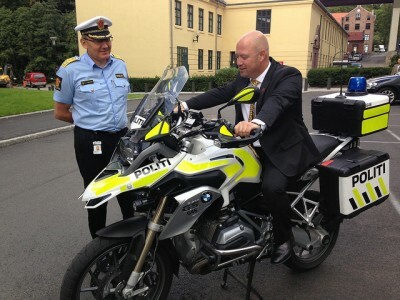 Police Director Odd Reidar Humlegård was expected to “be met with understanding” by the justice ministry, which ultimately is responsible for the country’s state police force. He was, with a justice ministry spokesman saying the request from Humlegård would be handled quickly, and a positive response coming from the justice minister Friday evening. A government proposal regarding the issue of armed police already had opened up for local police districts to be allowed to carry weapons at all times if they wanted to themselves. “They (the police directorate) have presented a quite clear, professional view on this, and we have followed up on it,” Anundsen said. “This has been done to take care of the police’s own safety and ability to respond quickly.” He granted Humlegård’s request, effective immediately, but on a temporary basis, with a new evaluation to be made in four weeks. Many police in Norway still don’t want to be routinely armed, though, with the state police academy and several police organizations criticizing the call to arms just earlier this week. A majority of police chiefs in local districts also have opposed moves to arm police at all times. On Friday, though, a spokesman for the police chiefs’ organization, Norges Politilederlag, said the group supported the evaluations made by both Humlegård’s office and respected the new, higher terror threat issued by the police intelligence unit PST (Politiets sikkerhetstjeneste) earlier this month. That threat specifically targeted police, military personnel and top politicians. The group therefore didn’t object to Humlegård’s decision to formally ask for permission to arm police officers. The major labour union representing the majority of police officers, Politiets Fellesforbund, has long supported routine arming. Its leader, Sigve Bolstad, called Humlegård’s request on Friday “a wise and correct” thing to do and was pleased the justice minister responded so quickly. It was initially unclear whether the routine arming would be a temporary measure, revoked if or when the terror threat against Norway is lowered. On Friday Anundsen decided to allow arming at all times for the next four weeks, subject to extension. He admitted that four weeks is a short period, but said it would allow for another evaluation since the threat situation can change. Humlegård had asked for permission for police to carry a pistol in a hip holster “for the foreseeable future” as “an extra means” of meeting the recently heightened terror threat. Anundsen said individual police districts can use their own judgment as to whether they feel being armed is necessary. Hadia Tajik, who leads the justice committee in parliament for the opposition Labour Party, said she thinks it’s reasonable to allow a temporary arming of police.